“Make sure you schedule a few hours a week to devote to reading.” What heavenly advice! Yet somehow the fact this was given as advice shocked me. I suddenly realized I am more used to hearing, “Stop reading and start doing something useful.” But the idea reading should be scheduled into your life feels strange and foreign to me. Reading is “fun”–this is what they repeatedly taught us in school. You’re supposed to do it because it’s fun, not because it helps you live. Maybe this contributes to us reading books less often. It was fair for teachers in my schooldays to try to stop me reading books, because I did read them in class, and I did neglect more productive work (like my math homework) to read. It also makes sense that teachers insist “reading is fun!” in order to get more students to read. However, somehow I internalized these messages as: reading is good but should only be done when you have nothing better to do. Which is not a problem as a kid, since you have quite a bit of free time. But as an adult, reading suddenly becomes a less justifiable activity–when in reality this is a problematic way to view reading! I certainly still read a lot, but I mainly read a lot of articles online, and the shortness of these articles probably deceives me into thinking I’m not actually wasting much time on them. I imagine I’m briefly and efficiently informing myself. But, of course, what I’m actually doing is feeding and fueling my addiction to information. You can never read enough interesting facts on the internet. But in order to gain a deeper understanding of reality you need more than interesting facts on the internet. You need books. In other words, I need to get past the idea that reading is not meant to be scheduled into your productive time, but only into your leisure time. If reading is only ever done for pure leisure, the result is you never pick up a challenging read. Reading that takes work is too much to do when your brain is already over-strained and tired. You end up reading only really light novels, or popularizations of fun topics (such as hygge or Nikola Tesla). Do you want to read about the categorical imperative after a hard day’s work? In other words, the important works–the works that have changed our civilization–never get read. We never apply ourselves to answering the questions they raise, because we don’t know what questions they raise. We never seek to face the challenges of humanity because we never justify applying ourselves to learning about them. It is, in fact, a nice solution to consider certain types of reading work. To consider this reading as necessary, and not just for building the practical skills that may in some way help you in your job. To consider reading as a thing that can form and shape character, and as a thing we actually should invest in in order to form and shape our own character. That this is not merely a leisure activity that is optional, but that we are justified in carving out space for this pursuit in our lives. I almost don’t dare to schedule in directed reading in my schedule. First of all, I hardly know where I’d fit it in. Second, many great works of great writers intimidate me. However, I should be more aware of the consequences of not doing this. Of reading lightly, and assuming I am well-read. Recently I was reading Augustine’s Confessions–a very classic work that has impacted Western civilization–and I was lying on the couch and feeling like very strange about being on that couch reading. In fact, I was even reading it in order to review it, but I still felt self-conscious. Then I realized that while I used to devour books when I was younger, I now intentionally push myself to read a physical book, and when I do sit down to read I feel like I really should be writing or cleaning my house or studying my schoolwork. Reading, as a mere input of information, feels like a sacrifice of the time you should be devoting to output. And the genius of the online world, and online reading, is that it creates the illusion you are both inputting and outputting information. You read articles in order to share them. You take in information in order to comment on it publicly. You create artistic representations of what you are doing by posting on Instagram, etc. While none of this online chatter really impacts the world greatly, your conscience doesn’t tug as much because you feel you’re using the information presented. You’re not just taking something in, but you’re offering something up to the world in return. It doesn’t matter how trivial what you offer is, you still gain the sense of accomplishment that comes by just offering it. But this overemphasis on output–on our individual response to the information that seems to be demanded by the internet, and our culture in general–glosses over the necessity of taking the time to input good information. Our responses are expected to be instant. If something takes a long time for us to process, it has to be really, really worth it before we decide it is justifiable to set that time aside. This year I actually took a year off to go back to school and study, and what I am learning is that to truly understand you actually need to do more than read the quick summaries of topics that float around on the internet. I thought I knew a lot about theology (my topic of study), and that some of the questions I’d fruitlessly searched for answers to probably did not have good answers, since I could not find any. However, the reality is that some of these answers were book-length, not internet-friendly listicles, and therefore I actually was justified in taking a year to study such things. In fact, I should really take a lifetime. The job of professional scholar is not an incredibly realistic role in our current society, but we do have unimaginable access to information in our modern world. Therefore I do have the opportunity to devote a lifetime to learning, even outside of school. The hurdle that I have to get over–and perhaps you do too–is the tendency to devalue the time we spend on the couch with a book. To devalue the patience that lets the classic authors of the past speak for themselves, instead of watching YouTube summaries. Ready to dive into reading again? Try my short retelling of Cinderella–is prince really such a catch for Cinderella? Prince Charming is available at Smashwords and Amazon. This is a post about a one-trait character showing all the reasons you shouldn’t be a one-trait character. As I said in this post, I myself have a tendency to view intelligence as my defining characteristic, but I found a remedy for that this year. Find people more intelligent than you! Let this post convince you of the necessity of being a well-rounded person. This post resulted from one critic complaining the professor did not hover over the children enough in The Lion, the Witch and the Wardrobe, while another critic complained the children did not grow up. First, helicopter parenting is not a good strategy to encourage children to grow up, and second, anyone who’s read the ending of The Lion, the Witch and the Wardrobe know the children do in fact grow up. This is a post about how I should not have enjoyed Out of the Silent Planet, but I did. It breaks some of the cardinal rules of fiction, and still manages to blow your mind. If you’re on the fence about reading C.S. Lewis’ Space Trilogy, let this review convince you. And if you’ve read it, let me know whether you agree! Classics are usually heavy reading. Even if they’re short, the language is unfamiliar enough that they take a long time to get through. But every once in a while you find one that surprises you, and here are three that surprised me. Note: I’m not including any classics described as ‘children’s literature’ in this list. I just really enjoyed the very punctual and methodical Phileas Fogg racing around the world with his comic French servant, Passepartout. They get into preposterous adventures of all sorts, some of which strain believability but are incredibly fun to read. It gives a wonderful picture of travel before airplanes were invented, with railroads and steamboats. Verne is known as a science fiction author, but this was a contemporary novel for him—and so for us it’s a nice view in on the past. Also, I loved the sudden revelation of Fogg’s tender side in the end. As a side note, Jules Verne’s novels have historically received poor English translations, which led him to have a higher reputation in his native France than in the English-speaking world. This is the only sample of his work I’ve read, but I quite enjoyed him. In addition, I’ve noticed publishers give this novel nonsensical cover pages – one edition had a hot air balloon, but hot air balloons failed to appear in the story. Another recent edition has a daredevil racing in an old-fashioned car, but this does not happen in the novel either. This remains the only Dickens novel I’ve read cover to cover. It’s short, so Dickens’ verbosity won’t put you off. The plot is easy enough to follow. I actually read it because I knew nothing about the plot and wanted to find out what this Christmas carol business everyone always went on about at Christmastime was all about, but I’ve reread it since without boredom. I’ve heard complaints about the opening paragraphs, where Dickens goes on about different types of nails and why the doornail should not be considered the ‘deadest’ type of nail out there, but personally I found it humorous. If you find it tedious, it’s a short novel, so it’s soon over and the rest of the plot begins! This was my introduction to Jane Austen, and I still believe it’s the easiest one to start with (though none of her novels are too difficult for the modern reader, aside from the formality of the language). This novel gets right into the action and humor, with Mr. Bingley arriving in town and Mrs. Bennett nagging her husband to go meet him. It does not start with family history, like Sense and Sensibility, Emma, and Mansfield Park. The heroine is lively enough that it’s not a chore to follow her through the story, and the story is shorter than Emma. There’s a few lulls in action, but overall it’s a very satisfying romance and shows off Austen’s talent very well. These are my recommendations—your mileage may vary! After all, I thought Lord of the Rings and The Iliad were surprisingly easy to get into, and I know many people who didn’t. And I just struggle with Wuthering Heights and Jane Eyre, while others just love them. But if you’re meaning to read a few novels that have stood the test of time, these are a few places to start! Last Friday The Guardian published a wonderful list of bookstores worldwide – including one from Canada, woohoo! Any book-lover knows there is no shortage of lovable bookstores out there, so which is your favourite? I’d have to say, from The Guardian‘s list, I want to visit the bookstore-in-a-van that sells Portuguese books translated into English. Leakey’s, in Scotland, looks worth visiting too. Shakespeare & Company, in Paris, is not included in this list – I have a feeling it might’ve been too cliche to include such a famous landmark. But in case you’ve forgotten, here’s my picture of the place from when I visited it last April! What’s my favourite library? I blogged about it once before. Share yours below! Unread Books, by Paulina Van Vliet. All rights reserved. I used to never buy a book I hadn’t read. That was what libraries were for – I didn’t want to buy something that might be garbage. Only after I knew the quality of the book would I buy a copy for myself. However, I have started seeing the error of my ways. Two recent blog posts brought this to my attention. The first – ‘The Virtue of Unread Books’ – argues that unread books are not merely pages on a shelf, but collectively they express an idea. When you stockpile books you’ve already read, Scott James argues, you’re basically making a monument to your accomplishment. Especially if you never re-read them. Look at what a well-rounded reader I am, you might be saying. In contrast, he argues, a shelf of unread books hints at more than past triumphs – it symbolizes possibility. A well-selected library opens the mind to what could be read and learned. And so, hopefully, you might actually go on to read and learn. The second post, ‘Busting a Book-Buying Myth,’ is directed at why you should buy books you may not read, rather than about owning them, but it comes down to the same thing in the end. Here, Ian Carmichael argues that even if you buy books you never finish, but you did get something useful out of them, it might be worth it. If it’s a useful book, at a reasonable price, why not buy it, even if it’s on an impulse? Also, if your owning of the book allows the book to give pleasure or information to someone who is not you – someone who borrows it, or happens to read it at your house – then it is worthwhile to own it as well. I really enjoyed this post, because it gave me a different perspective on my book-buying habits. Absolutely, a library should be more than a monument to what you have read in your life. It could be what you should read, or books you know would give pleasure to others (visitors to your home, or people you lend your books to). However, just because I own a book and intend to read it, doesn’t mean I will. In fact, it makes it a bit more likely I won’t. I’ll procrastinate because I know I’ll always have it, right there on my bookshelf for when I have ‘more time.’ But books I don’t own, well, those I better read quick. This, however, is not an excuse for me not to buy and own books I should read – their collective spines on my shelf may someday shame me into picking them up. 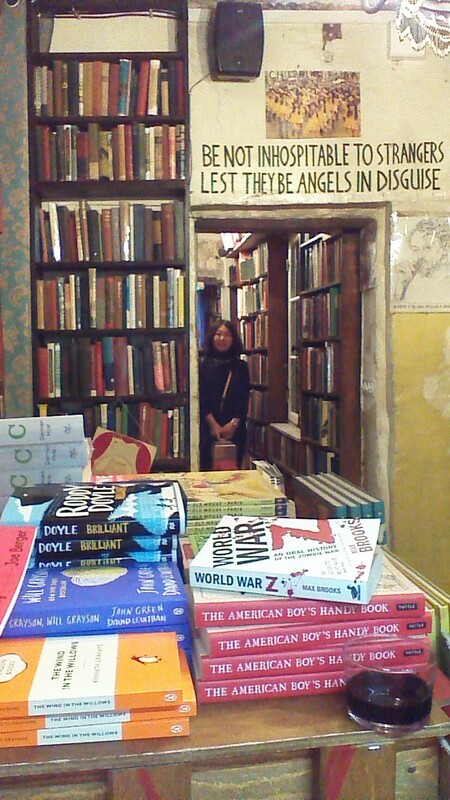 After all, I do get immeasurable joy from sitting in front of shelves of excellent books, even if I haven’t read them yet, because I know there are so many treasures for me yet to discover. This joy alone gives well-selected libraries a reason to exist. Secondly, I think that using your library as a source of information – well, that works better for some things than others. It works great for classics. If I want to know what Herodotus said about the Persian wars, I can flip through it and look it up. Or if I forget a certain quotation from Jane Austen – same deal. But when it comes down to information more often classified as ‘facts’ or ‘non fiction,’ I’d consult the internet before my library. First, it’s faster. It’s more likely the internet has addressed that topic, rather than the off-chance I bought a book on the topic once. I can get multiple points of view on that ‘fact’ and try to determine if it should be called a fact. And, lastly but not least important, it is far easier to find info that includes the most recent updates online than in the encyclopedia you bought a decade ago. Of course, for real, in-depth research the internet often falls short of a book, but in the case you need an excellent, well-researched and written source on something, the library is the place to look. After all, if you owned a library of your own on the most recent, up to date info on every topic you cared about, you might just be constructing a monument to your own interests after all. So, readers, what do you think? Have you read every book that sits on your shelves, or must you admit there are a couple you haven’t cracked open? Is it worth owning them anyway? I mean, do you hear voices of narrators and characters speaking out loud in your head when you’re reading? I’d never thought about this before. I’m struggling to remember what I actually hear when I read, but I think I enter the fictional world so completely that it’s hard for me to pin down individual sensations when I snap out of it. However, many people do hear voices. And accents. This phenomenon was brought by to me by a lovely lady I was having lunch with this week. She insisted she heard books by Welsh authors read out in her head in a Welsh accent, and British authors in a British one. Until this point, I’d never considered this. I guess I always imagined everyone experienced books in exactly the same way as me. But that would be a terribly ridiculous assumption, wouldn’t it? No one experiences the same book in exactly the same way. That’s part of the fun! Just to prove this is not in the head of only one person in this world, I will point you to an article in The Guardian where readers describe all sorts of audible and visual experiences while reading, including – you guessed it, people who are not sure they hear anything at all. Very interesting read! There are all kinds of people in the world, after all. Okay, now I am off to power-read three chapter of The Hitchhiker’s Guide to the Galaxy, which the informal book club I belong to has decided to read next. Leave your experiences with disembodied voices in the comments! Do you hear voices when you read? J.K. Rowling is Not Dead – But Why Does She Want You To Know What Harry Potter’s Up To? J.K. Rowling, as the infamous Rita Skeeter, wrote a follow-up to Harry Potter. Harry has a new scar. He and Ginny might be having problems. Ron’s hair is thinning, while Hermione’s hair is – still not behaving. And so on. Heresy, you might cry. The Harry Potter series is finished. Who does this J.K. Rowling person think she is, going back and adding stuff? This is just as bad as the time she declared Ron and Hermione should’ve never gotten married, and that Harry was Hermione’s One True Pairing after all. She went and wrote a whole sappy epilogue, naming each and every one of their children, and why did she do that if it was all a mistake? Does an author have a right to do this – this is the question. This is a legitimate argument. This is legitimate because it’s a question that faces all authors and readers – is the printed word the final word? Or can the author go back later and say she or he did it wrong, and really it all should’ve turned out completely differently? Or, most shockingly of all, should we bow to the readers, and agree that whatever the readers feel happened is what really happened, even if it’s completely delusional? The Harry Potter series illuminates this dilemma perfectly, in a way perhaps no other series ever has. Take the Ron/Hermione/Harry debate. If you want to get Harry Potter fan riled up, do bring this up. I met a couple random strangers on a sunny evening in Paris, and this was a topic we debated, because we all knew about Harry Potter. And most people will take sides, as to whether the books support either pairing. But that’s not the fundamental question. The fundamental question is – can an author go back and change something she wrote down as actually having happened? In this case, say Ron and Hermione’s relationship was a mistake? Here’s what my position was that sunny evening in Paris. Basically – what the author wrote should be it. The printed word is what the reader experiences, so a couple verbal sentences tossed off in an interview shouldn’t be able to contradict anything. Now, if the author wants to go and write another sequel, and explain how things didn’t quite turn out as well as the previous book presented them, well then, go ahead. But respect your work and stand by it otherwise. This seemed entirely reasonable to me at the time, but now I realize it’s not quite that simple. Because we don’t live in a world where our experiences are limited to the printed page anymore. It’s not a singular experience between the covers of a book, or an episode of TV viewed once, or a movie you only caught in theatres. No, nowadays our stories can be watched and re-watched, and we can compile characters lists, and lists of tropes, and make vast encyclopedias of every little detail of a work we love. And we create, most importantly, fan communities. And somehow author’s works are not mere stories, but worlds, and these world spill beyond whatever medium the story was originally told in. Obviously, this is all thanks to the internet. And Harry Potter’s popularity has been fueled by the internet in a way few books before it ever were. Harry Potter and the Sorcerer’s Stone was published in 1997. And during the late 1990s, traffic on the internet was growing by about a hundred percent a year. How much of that traffic was on Harry Potter fan websites and communities I’m not sure, but there was a good chunk of it that drove the fan experience. So the readers’ experience with Harry Potter likely goes beyond the printed page. We’d debate and predict endless theories of what would happen, and view each others’ fanart, and look at fanfiction. And this runs right up against another darling literary concept, and drives this whole debate. There’s a lovely little concept known as ‘death of author’ – in other words, it’s the idea that an author’s own interpretation of their work is no more valid than anyone else’s. Whatever their intentions are, it’s not important, so endless debates over the author’s intentions are meaningless. What matters is what the reader gets when reading it. Authors tend to not love this idea, of course, not in the least because in theory someone could declare what you wrote means the opposite of what you meant. This is a concept J.K. Rowling seems to have devoted her Harry Potter series to fighting. Whether this was intentional, I’m not sure. But it’s plain as the nose on your face that she doesn’t believe in it. Obviously, she does think she has the creative ability to add details to the story after the fact, whether it’s by announcing Dumbledore is gay, or Ron and Hermione’s relationship was a mistake, or hinting Harry and Ginny may not be completely happy. She happily feeds her fan communities the details they clamour for. And you know what? She’s always done that – she’s always extended the world of Harry Potter beyond the printed page. Between the releases of her books, she used to post elaborate puzzles that led to clues for the new book’s title, or hold polls as to which question about the book she should answer. And then, when the series was done, she granted interviews to a couple of webmasters of incredibly popular Harry Potter websites, to fill in all the details that the series hadn’t addressed. Including, incidentally, her opinion at the time on Harry-and-Hermione (that believers in that ship were ‘delusional.’ How times change!) Lastly, she’s created Pottermore. That’s like spitting in the face of ‘death of the author.’ This author is definitely alive! Does this give me hope? Does it give me the authority to tell readers what I really meant when I wrote those ebooks you see over to the right of my blog? You know, I suddenly find leaning towards the readers’ side. Because, come to think of it, I don’t always want to know every single details about these fictional world. And some of these details I would like to know – I’d like to experience them on the printed page, finding them out through the eyes of another character, rather than from the mouth of the author herself. That almost collapses the suspension of disbelief, injecting the reality of the author too firmly onto a fantasy. That’s not what I’m advocating for. Oh dear, I’m going to argue for, of all things – balance. Once again. You need to leave the reader with some freedom to own their own experience in a book. But you don’t have to hand over the reins. What do you think? Who should get the final say? And do agree J.K. Rowling is dealing a blow to death of the author?